Prior to visiting the villages, we made arrangements to photograph artisanal pole-caught fishing operations for bonito, a type of small tuna. In this famously beautiful spectacle, fishers toss buckets of bait fish in the water, sending the tuna into a feeding frenzy. 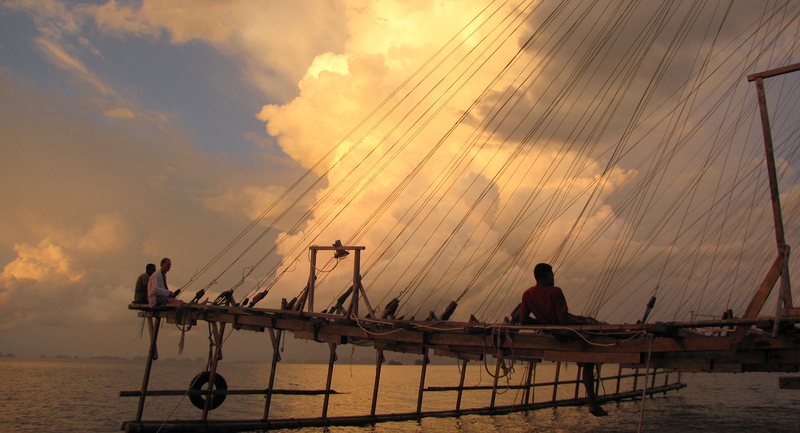 Fishers then plunge a single hooked line attached to a long pole into the water, snare the frenzied fish, and toss them one by one into the boat. We couldn’t wait to see the operation in play and spent days tracking down and coordinating with a captain. 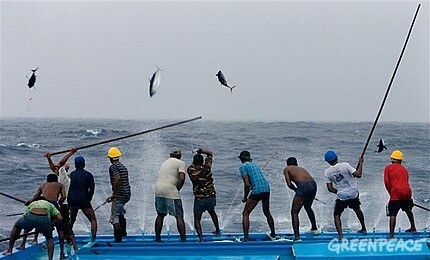 Finally, he told us the tuna boat would pick us up at one of the bait fishing boats. So long as the bait boat caught enough small fish and squid, then we could all go out tuna fishing, but without enough bait, fishing would be impossible. We ventured out around sunset and climbed aboard a strange contraption of wood and wire, which hardly resembled a boat at all. 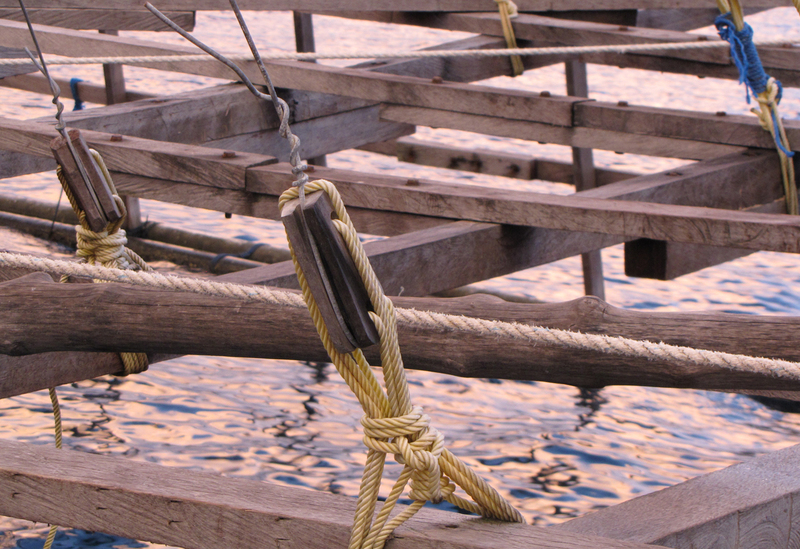 A thin steel hull supported a latticed platform made of huge wooden beams held up by thick metal wires. Young sinewy men moved across the platform like graceful spiders, dropping a large flat weathered net into the water. From the center of the boat, an old engine sputtered to life, coughed black smoke, and fired on underwater lights, which would lure the bait. 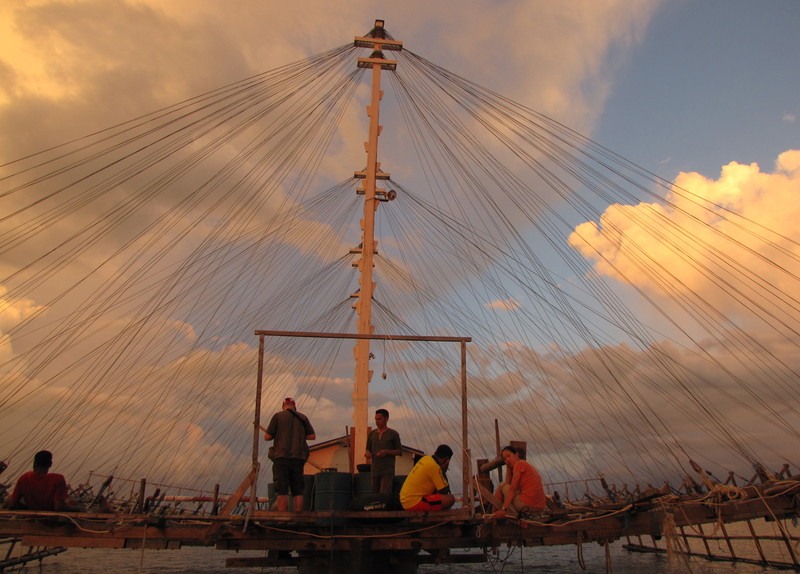 After about an hour or so, men gathered the net, slowly, piece by piece, moving from stern to bow, consolidating the fish. We waited on board, growing weary with each passing hour as the net rose and fell, fishing throughout the night, slowly amassing buckets of little fish. Most of the fishermen were young men or teenage boys who lived out here for a week at a time. They slept by day and fished by night, their only shelter a cockroach ridden hut in the center of the platform, their only food, rice and fish scraps from their catch. Finally at about 2 am the tuna boat arrived. But we didn’t have nearly enough bait to justify making the trek to the tuna grounds, even after eight straight hours of fishing. Later conversations revealed that fishers have had a harder and harder time catching enough bait fish. There are too many bait boats (we counted at least nine in our immediate vicinity) fishing night after night. I had (perhaps naively) always imagined that artisanal fisheries were small scale, subsistence occupations that had minimal impact on the environment. 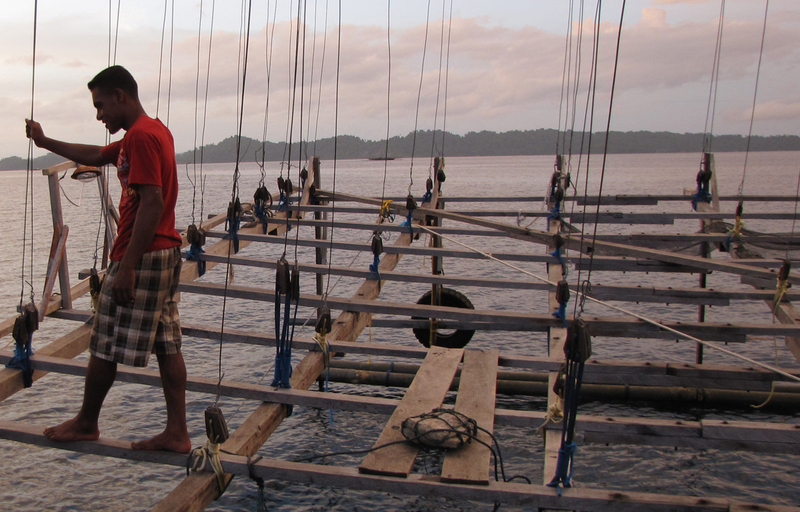 And yet here in Raja Ampat we had seen the opposite in both the live fish trade operations and now the bait fish boats – fishers were putting ever more effort to catch fewer and fewer fish. The problem lies not in the method, but in the market. Raja Ampat’s rich waters have sustainably fed small local populations for millennia, but surely cannot support a national tuna trade or a global live fish market. Using artisanal, rather than industrial methods, will simply slow the process.